Are you an undergraduate student, pre-registration pharmacist, or an early career pharmacy technician? Have you been doing some great, innovative work? If you have been conducting research in the field of mental health pharmacy to support practice development we'd love to hear from you. Apply for a CMHP research award so your achievements can be recognised and the wider pharmacy community can learn from your findings. We are seeking applications for the undergraduate pharmacist, pre-registration pharmacist, and pharmacy technician research awards. For details of how to apply for an award or bursary, please visit the Awards and Bursaries page. This page then links to further details for each category of award. We look forward to you sharing your excellent work with members and the pharmacy community - through a poster presentation at our conference, and by including your abstract, or an article, in our newsletter or website. 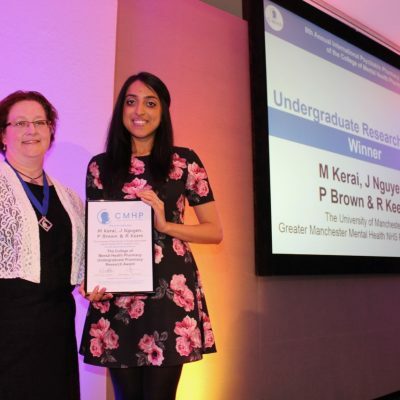 Pictured is the 2017 Undergraduate Research Award winner Meena Karsan Kerai (right) receiving her award from Nikki Holmes (CMHP President 2016-17).